We live at a time when almost all of the information that we need are readily accessible on the worldwide web. The technology has become so ingrained in all aspects of our lives that we have gotten so used to it and maybe even taken it for granted. Sadly, this access to unlimited learning potential is not available in several parts of the country, especially in areas that do not have access to electricity. 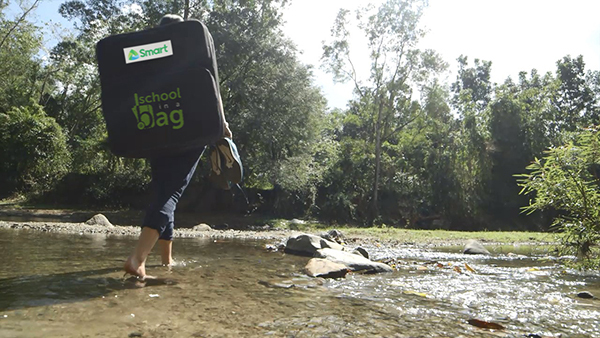 This is where SMART's School-in-a-Bag initiative comes in. By partnering with Gary Valenciano's Shining Light Foundation, they provide a digital learning package that contains educational and connectivity tools (laptops, tablets, TV, smartphone, pocket WiFi), learning modules and a solar panel to underserved communities to give educators and learners in remote areas the opportunity to learn through modern learning tools and access to the internet’s wealth of information and content. Individuals, companies and organizations may sponsor School-in-a-Bag packages that can be sent to schools in remote communities. For more information, interested donors may email technocart@smart.com.ph or visit this link.